Berkeley ( /ˈbɜːrkli/ BURK-lee) is a city on the east shore of San Francisco Bay in northern Alameda County, California. It is named after the 18th-century Irish bishop and philosopher George Berkeley. 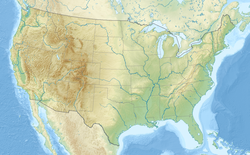 It borders the cities of Oakland and Emeryville to the south and the city of Albany and the unincorporated community of Kensington to the north. 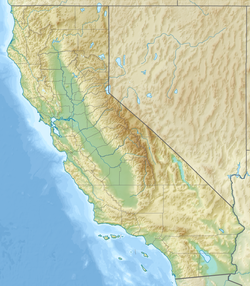 Its eastern border with Contra Costa County generally follows the ridge of the Berkeley Hills. The 2010 census recorded a population of 112,580. 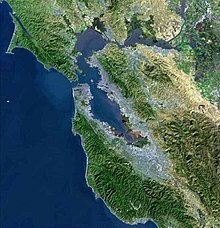 The site of today's City of Berkeley was the territory of the Chochenyo/Huchiun band of the Ohlone people when the first Europeans arrived. Evidence of their existence in the area include pits in rock formations, which they used to grind acorns, and a shellmound, now mostly leveled and covered up, along the shoreline of San Francisco Bay at the mouth of Strawberry Creek. Other artifacts were discovered in the 1950s in the downtown area during remodeling of a commercial building, near the upper course of the creek. The first people of European descent (most of whom were of mixed race and born in America ) arrived with the De Anza Expedition in 1776. Today, this is noted by signage on Interstate 80, which runs along the San Francisco Bay shoreline of Berkeley. The De Anza Expedition led to establishment of the Spanish Presidio of San Francisco at the entrance to San Francisco Bay (the Golden Gate). Luis Peralta was among the soldiers at the Presidio. For his services to the King of Spain, he was granted a vast stretch of land on the east shore of San Francisco Bay (the contra costa, "opposite shore") for a ranch, including that portion that now comprises the City of Berkeley. Luis Peralta named his holding " Rancho San Antonio". The primary activity of the ranch was raising cattle for meat and hides, but hunting and farming were also pursued. Eventually, Peralta gave portions of the ranch to each of his four sons. What is now Berkeley lies mostly in the portion that went to Peralta's son Domingo, with a little in the portion that went to another son, Vicente. No artifact survives of the Domingo or Vicente ranches, but their names survive in Berkeley street names (Vicente, Domingo, and Peralta). However, legal title to all land in the City of Berkeley remains based on the original Peralta land grant. In 1908, a statewide referendum that proposed moving the California state capital to Berkeley was defeated by a margin of about 33,000 votes. The city named streets around the proposed capitol grounds for California counties. They bear those names today, a legacy of the failed referendum. The postwar years brought moderate growth to the city, as events on the U.C. campus began to build up to the recognizable activism of the sixties. In the 1950s, McCarthyism induced the university to demand a loyalty oath from its professors, many of whom refused to sign the oath on the principle of freedom of thought. 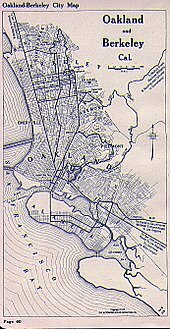 In 1960, a U.S. House committee ( HUAC) came to San Francisco to investigate the influence of communists in the Bay Area. Their presence was met by protesters, including many from the university. Meanwhile, a number of U.C. students became active in the civil rights movement. Finally, in 1964, the university provoked a massive student protest by banning distribution of political literature on campus. This protest became the Free Speech Movement. As the Vietnam War rapidly escalated in the ensuing years, so did student activism at the university, particularly that organized by the Vietnam Day Committee. Berkeley is strongly identified with the rapid social changes, civic unrest, and political upheaval that characterized the late 1960s. In that period, Berkeley—especially Telegraph Avenue—became a focal point for the hippie movement, which spilled over the Bay from San Francisco. Many hippies were apolitical drop-outs, rather than students, but in the heady atmosphere of Berkeley in 1967–1969 there was considerable overlap between the hippie movement and the radical left. An iconic event in the Berkeley Sixties scene was a conflict over a parcel of university property south of the contiguous campus site that came to be called " People's Park." In 1995, California's Costa-Hawkins Rental Housing Act ended vacancy control, allowing rents to increase when a tenant moved out. Despite a slow down in 2005–2007, median home prices and rents remain dramatically higher than the rest of the nation,  fueled by spillover from the San Francisco housing shortage and population growth. 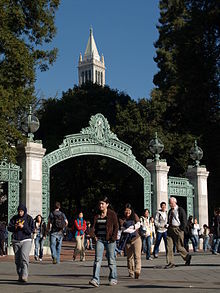 With an economy dominated by the University of California and a high-demand housing market, Berkeley was relatively unaffected by the Great Recession. State budget cuts caused the University to increase the number of out-of-state and international students, with international enrollment, mostly from Asia, rising from 2,785 in 2007 to 5,951 in 2016. Since then, more international restaurants have opened downtown and on Telegraph Avenue, including East Asian chains such as 85C Bakery Cafe and Daiso. The current wave of downtown apartment construction began in 1998, with the construction of a 56 unit mixed use building at 1910 Oxford Street. The developer, Panoramic Interests, followed up with a total of 368 apartments in 7 buildings between 1998 and 2004. Soon afterwards, other developers also began building in Berkeley. One of the buildings from this era was the site of the 2015 Berkeley balcony collapse disaster. Berkeley lies within telephone area code 510 (until September 2, 1991, Berkeley was part of the 415 telephone code that now covers only San Francisco and Marin counties ), and the postal ZIP codes are 94701 through 94710, 94712, and 94720 for the University of California campus. A notorious segment of the Hayward Fault runs lengthwise down the middle of Memorial Stadium at the mouth of Strawberry Canyon on the University of California campus. Photos and measurements  show the movement of the fault through the stadium. Berkeley has a cool summer Mediterranean climate (type Csb in the Köppen climate classification), with dry summers and wet winters. Berkeley's location directly opposite the Golden Gate ensures that typical eastward fog flow blankets the city more often than its neighbors. 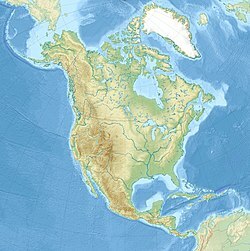 The summers are cooler than a typical Mediterranean climate thanks to upwelling ocean currents along the California coast. These help produce cool and foggy nights and mornings. 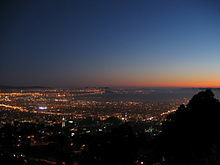 The 2010 United States Census  reported that Berkeley had a population of 112,580. The population density was 10,752 people per square mile of land area (4,104/km²). 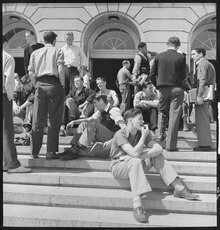 The racial makeup of Berkeley was 66,996 (59.5%) White, 11,241 (10.0%) Black or African American, 479 (0.4%) Native American, 21,690 (19.3%) Asian (8.4% Chinese, 2.4% Indian, 2.1% Korean, 1.6% Japanese, 1.5% Filipino, 1.0% Vietnamese), 186 (0.2%) Pacific Islander, 4,994 (4.4%) from other races, and 6,994 (6.2%) from two or more races. Hispanic or Latino people of any race were 12,209 persons (10.8%). 6.8% of the city's population was of Mexican ancestry. According to the 2011 American Community Survey 5-Year estimate, the median income for a household in the city was $60,908, and the median income for a family was $102,976. Males had a median income of $67,476 versus $57,319 for females. The per capita income for the city was $38,896. About 7.2% of families and 18.3% of the population were below the poverty line, including 13.2% of those under age 18 and 9.2% of those age 65 or over. Berkeley is served by Amtrak ( Capitol Corridor), AC Transit, BART ( Ashby, Downtown Berkeley Station and North Berkeley) and bus shuttles operated by major employers including UC Berkeley and Lawrence Berkeley National Laboratory. 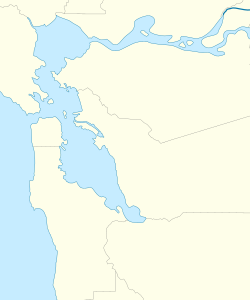 The Eastshore Freeway ( Interstate 80 and Interstate 580) runs along the bay shoreline. Each day there is an influx of thousands of cars into the city by commuting UC faculty, staff and students, making parking for more than a few hours an expensive proposition. Berkeley has had recurring problems with parking meter vandalism. In 1999, over 2,400 Berkeley meters were jammed, smashed, or sawed apart. Starting in 2005 and continuing into 2006, Berkeley began to phase out mechanical meters in favor of more centralized electronic meters. Ashby Avenue ( Highway 13), which also runs from Berkeley's bayshore to the hills, connects with the Warren Freeway and Highway 24 leading to the Caldecott Tunnel, named for a former Berkeley mayor. San Pablo Avenue ( Highway 123) runs north–south through West Berkeley, connecting Oakland and Emeryville to the south and Albany to the north. Solano Avenue, a major street for shopping and restaurants, runs east-west near the north end of Berkeley, continuing into Albany. 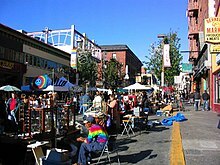 Since 1974, Solano Avenue has hosted the annual Solano Avenue Stroll and Parade  of the twin-cities of Albany and Berkeley, the East Bay's largest street festival. 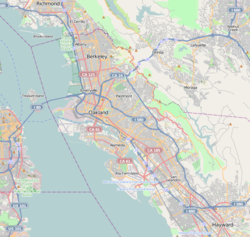 The Eastshore Freeway ( I-80 and I-580) runs along Berkeley's bayshore with exits at Ashby Avenue, University Avenue and Gilman Street. 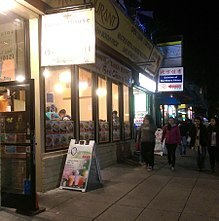 North of Downtown is the North Berkeley neighborhood, which has been nicknamed the " Gourmet Ghetto" because of the concentration of well-known restaurants and other food-related businesses. West of North Berkeley is Westbrae, a small neighborhood through which part of the Ohlone Greenway runs. Meanwhile, further north of North Berkeley are Northbrae, a master-planned subdivision from the early 20th century, and Thousand Oaks. Above these last three neighborhoods, on the western slopes of the Berkeley Hills are the neighborhoods of Cragmont and La Loma Park, notable for their dramatic views, winding streets, and numerous public stairways and paths. The Campanile ( Sather Tower) in the University of California, Berkeley campus. The city has many parks, and promotes greenery and the environment. The city has planted trees for years and is a leader in the nationwide effort to re-tree urban areas. [ citation needed] Tilden Regional Park, lies east of the city, occupying the upper extent of Wildcat Canyon between the Berkeley Hills and the San Pablo Ridge. The city is also heavily involved in creek restoration and wetlands restoration, including a planned daylighting of Strawberry Creek along Center Street. The Berkeley Marina and East Shore State Park flank its shoreline at San Francisco Bay and organizations like the Urban Creeks Council and Friends of the Five Creeks the former of which is headquartered in Berkeley support the riparian areas in the town and coastlines as well. César Chávez Park, near the Berkeley Marina, was built at the former site of the city dump. The Graduate Theological Union, a consortium of nine independent theological schools, is located a block north of the University of California Berkeley's main campus. The Graduate Theological Union has the largest number of students and faculty of any religious studies doctoral program in the United States. In addition to more theological schools, Zaytuna College, a newly established Muslim liberal arts college, has taken 'Holy Hill' as its new home. Wright Institute, a psychology graduate school, is located in Berkeley. Berkeley City College is a community college in the Peralta Community College District. The first public school in Berkeley was the Ocean View School, now the site of the Berkeley Adult School located at Virginia Street and San Pablo Avenue. The public schools today are administered by the Berkeley Unified School District. In the 1960s, Berkeley was one of the earliest US cities to voluntarily desegregate, utilizing a system of buses, still in use. The city has one public high school, Berkeley High School (BHS). Established in 1880, BHS currently has over 3,000 students. 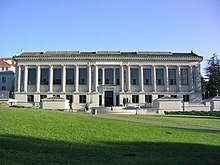 The Berkeley High campus was designated a historic district by the National Register of Historic Places on January 7, 2008. Saint Mary's College High School, a Catholic school, also has its street address in Berkeley, although most of the grounds and buildings are actually in neighboring Albany. Berkeley has 11 public elementary schools and three middle schools. Nancy Skinner remains the only student to have served on the City Council, elected in 1984 as a graduate student. Today, most of the University housing is located in District 7 (although Foothill and Clark Kerr are in Districts 6 and 8, respectively). Districts 4 and 7 are majority-student. The City of Berkeley in 2014 passed a redistricting measure to create the nation's first student supermajority district  in District 7, which in 2018 elected Rigel Robinson, a 22-year-old UC Berkeley graduate and the youngest Councilmember in the city's history. 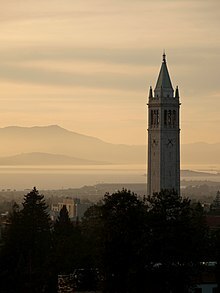 Berkeley is also part of Alameda County, for which the Government of Alameda County is defined and authorized under the California Constitution, California law, and the Charter of the County of Alameda. The county government provides countywide services, such as elections and voter registration, law enforcement, jails, vital records, property records, tax collection, public health, and social services. The county government is primarily composed of the elected five-member Board of Supervisors, other elected offices including the Sheriff/Coroner, the District Attorney, Assessor, Auditor-Controller/County Clerk/Recorder, and Treasurer/Tax Collector, and numerous county departments and entities under the supervision of the County Administrator. ^ Mitchell, Don (1992). "Iconography and locational conflict from the underside: Free speech, People's Park, and the politics of homelessness in Berkeley, California". Political Geography. 2 (2): 152–169. doi: 10.1016/0962-6298(92)90046-V.
^ a b c d e f g h Mitchell, Don (July 1997). "The Annihilation of Space by Law: The Roots and Implications of Anti-Homeless Laws in the United States". Antipode. 29 (3): 303–335. doi: 10.1111/1467-8330.00048. ISSN 0066-4812. ^ a b c Mitchell, Don (1992-03-01). "Iconography and locational conflict from the underside: Free speech, People's Park, and the politics of homelessness in Berkeley, California". Political Geography. 11 (2): 152–169. doi: 10.1016/0962-6298(92)90046-V. ISSN 0962-6298. ^ Mitchell, Don, Heynen, Nik (16 May 2013). "The Geography of Survival and the Right to the City: Speculations on Surveillance, Legal Innovation, and the Criminalization of Intervention". Urban Geography. 30 (6): 611–632. doi: 10.2747/0272-3638.30.6.611 – via Taylor & Francis Online. ^ Keuroghlian, Alex S.; Shtasel, Derri; Bassuk, Ellen L. (2014). "Out on the Street: A Public Health and Policy Agenda for Lesbian, Gay, Bisexual, and Transgender Youth Who Are Homeless". The American Journal of Orthopsychiatry. 84 (1): 66–72. doi: 10.1037/h0098852. PMC 4098056. PMID 24826829. ^ Mitchell, Don (March 1995). "The End of Public Space?People's Park, Definitions of the Public, and Democracy". Annals of the Association of American Geographers. 85 (1): 108–133. doi: 10.1111/j.1467-8306.1995.tb01797.xa#aHR0cDovL3d3dy50YW5kZm9ubGluZS5jb20vZG9pL3BkZi8xMC4xMTExL2ouMTQ2Ny04MzA2LjE5OTUudGIwMTc5Ny54YT9uZWVkQWNjZXNzPXRydWVAQEAw (inactive 2019-02-16). ^ Steinbach, Alan (2001). "The Berkeley Suitcase Clinic: Homeless Services by Undergraduate and Medical Student Team". Academic Medicine. 76 (5): 524. doi: 10.1097/00001888-200105000-00058. ^ National Research Council (US) Committee on an Assessment of Research Doctorate Programs; Ostriker, J. P.; Kuh, C. V.; Voytuk, J. A. (2011). A Data-Based Assessment of Research-Doctorate Programs in the United States. Nap.edu. doi: 10.17226/12994. ISBN 978-0-309-16030-8. PMID 22379653.